Android One, Google’s global initiative to bring high-quality smartphones to as many people as possible, aims bring affordable and high-quality smartphones to users in the Philippines through partnerships with phone manufacturers and telecom operators like Smart. Smart and Sun brands will be offering the Cherry Mobile One phone through attractively priced postpaid plans, which will also include FREE data allowance for Android OS updates and Google Play downloads for the first six months of the subscription. This will allow subscribers to enjoy Google’s app updates without the worry of additional data charges. Additionally, Android One phone users will be able to download paid apps on Google Play and make in-app purchases using their prepaid loads or charge it to their postpaid accounts. They would simply have to click “Enable Smart Communications billing” when they make a Google Play transaction so they can enjoy their favorite apps and games even without a credit card. See Smart Launches Pay-With-Mobile Service for iOS App Store, iTunes, and Mac App Store. Cherry Mobile One (left) and MyPhone Uno (right). 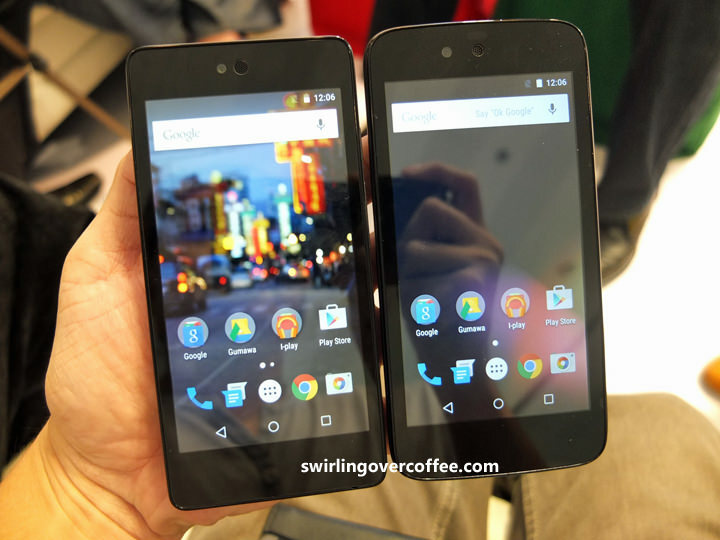 To learn more about Android One and to see the specs of the first Android One phones in the country, see Android One Locally Launched, with Cherry Mobile and MyPhone as Pioneer Partners. Stay tuned for our review of the MyPhone Uno.